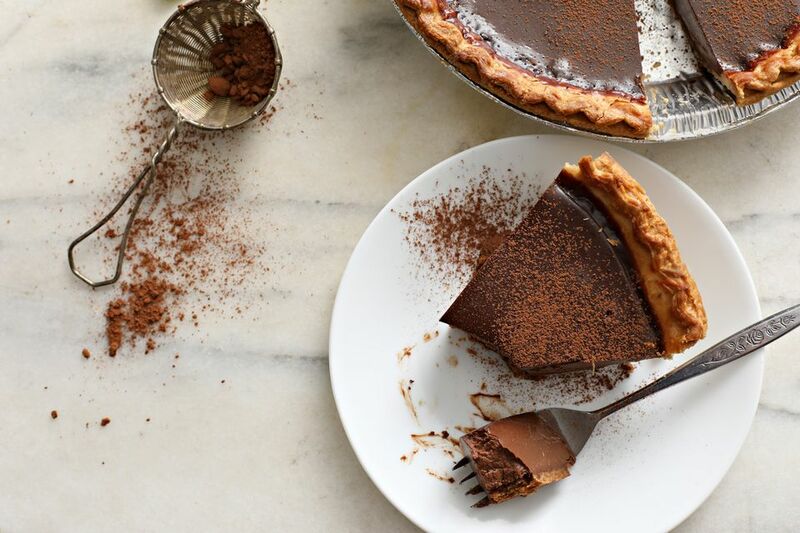 This super easy chocolate peanut butter tofu pie, similar to a French silk pie, is vegan and can be prepared in just a few minutes. Just be sure to use vegan chocolate. Use a gluten-free pie crust and this vegan pie can easily be made gluten-free as well. This one is a classic recipe that's been floating around vegan circles for decades now. Sure, you can make vegan pies much fancier than this one (with much more expensive and exotic ingredients), but I like to keep it old school and simple, from time to time. Plus, all of these ingredients are things you can easily keep on hand, and once you've tried this recipe a few times, you can probably whip it up off the top of your head. Tofu as a base, chocolate chips and peanut butter for flavor and a little bit of soy milk to mix it all together. Blend, bake, chill and done. Be sure you use semi-sweet chocolate chips in this recipe since there's otherwise no sugar. It's not a super sweet recipe, even with the semi-sweet chocolate chips, but the richness of the peanut butter more than makes up for it, in my opinion. If you're used to super-sweet desserts, you might disagree, or, you might be pleasantly surprised with just how much you like it! Enjoy your chocolate tofu peanut butter pie! Melt the chocolate chips over low heat, stirring frequently to ensure the chocolate doesn't burn. You can use a double boiler if you have one. Once the chocolate is melted, blend together the peanut butter, silken tofu, chocolate and soy milk in the blender until smooth and creamy, adding a bit more soy milk if necessary. Pour into pie crust and refrigerate until firm, at least one hour.